Please note unless you are a vet, treating animals in the UK is illegal, but please encourage your vet to use this Drug FREE and Surgery FREE method of treating animals. Avazzia Advanced Technology in microcurrent offer a natural organic Healing method that is kind to your precious pet or prize winning stock without drugs or surgery. BEST-Vet PRO give veterinarians, pet lovers and livestock owners a way to treat pain and soreness without drugs or surgery. Using microcurrent specifically designed for animals’ sensitive systems, BEST-Vet PRO product offers soothing massage. Stimulating animals’ own healing resources may improve the well being and performance of pets, livestock and competition animals. BEST-Vet PRO provides pain relief, wound healing and increased range of motion for animals under stress. Ranchers have used BEST-Vet PRO to help revive calves; hunters have used BEST-Vet PRO to help their dogs recover after a hard day in the field; horsemen and horsewomen have used BEST-Vet PRO in a variety of applications – to help range of motion, improve wound healing and treat founder (laminitis). Non-pharmaceutical, non-invasive treatment for acute and chronic pain in animals, either through direct application of the device’s onboard electrodes or by using conductive brush electrode, conductive pads or loop-and-hook sleeves. Treatment to improve range of motion, including “locked up” joints. Treatment to help increase perfusion for better blood circulation and improved lymphatic drainage. BEST-Vet PRO is used on animals in place of or in addition to therapeutic massage to reduce stress and improve performance. Short stories about how Avazzia’s BEST-Vet PRO has helped animals are here. Avazzia devices are safe to use directly on animals. The Avazzia training site offers suggestions on how to treat animals. 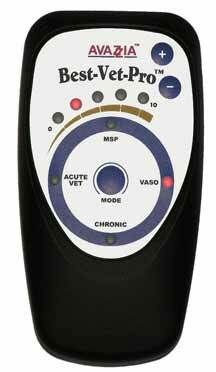 The BEST-Vet PRO device is for pain relief for pets and animals. Device is not for human use. Warning: Not intended for individuals with pacemaker or other implanted electronic device or who may be pregnant.